Earlier this year, we profiled Edie DePoorter-Dixon and her husband Daniel Dixon. 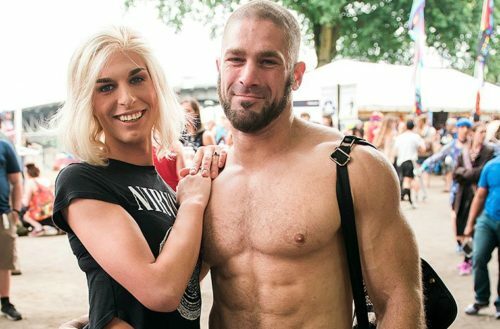 While attending Pride in Orlando, Florida, the pair were photographed and interviewed by The New York Times‘ Women in the World column because Edie is transgender and a Donald Trump supporter. DePoorter-Dixon doubled down and supported Trump even after he announced his proposed ban of transgender people from the military. I am actually very satisfied. This is Trump showing that he is a president for equality because this isn’t about transgender people, this is about transgender treatment. And if you look at the medical disqualifying guidelines of the military that they use, we are medically reliant. And therefore disqualifies us. We are no better than diabetics. We are no better than asthmatics. We should be disqualified at enlistment because we are medically reliant. Well, it looks like the married couple have broken up — as Daniel Dixon took to social media to share that he is sleeping alone and in desperate need of some oxytocin, the chemical produced from spooning. Maybe politics got in between the pair? Regardless, line for his little spoon begins behind me.